We were very satisfied with the sales process and very pleased with the overall service and advice we received and have recommend you to other people we know. Highland campervans gave us all the information we needed to make a sensible choice for a van that met all our requirements. They gave us time to decide and were extremely good at explaining how everything works when we came to pick up our van - taking over 2 hours to ensure we had all the information we needed to be able to enjoy our campervan fully and safely. They have tremendous experience in the field and we know that they will be able to help provide any future advice or extras that we might need. All the staff went over and beyond to help with practical matters for us. 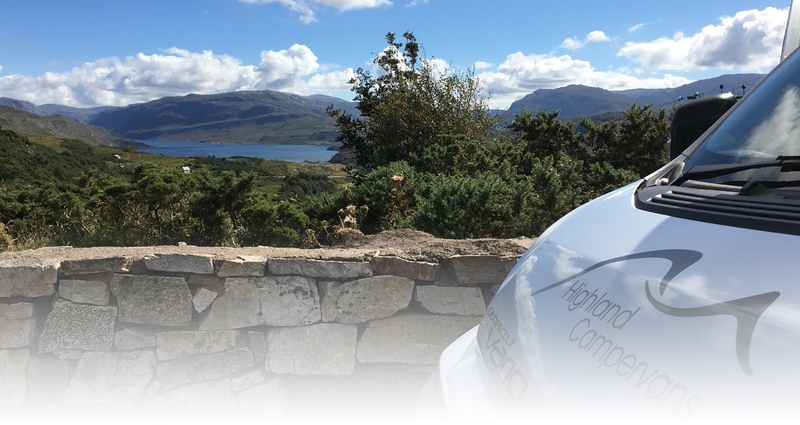 We would strongly recommend Highland campervans to anyone looking to purchase their own. Now home after our first night in the Sport and Fun. Thanks to your very professional handover everything went very smoothly and we were extremely comfortable. Thank you very much for everything that you did to make buying and using the van a great experience. Ian & Lesley MacDonald, Ullapool. I entrusted the sale of my motorhome to Highland Campervans by means of their brokerage service. I cannot speak too highly of the service I received and did feel in very safe hands. The initial information I was given was very clear and detailed and I was kept informed every step of the way. The whole process was so easy for me. I would recommend this firm to anyone thinking of using a brokerage service to sell their vehicle. They are large enough to generate a speedy sale but small enough to leave you with the impression that they really care about getting the best deal for their customers. Many thanks to your engineer for his help in explaining how to fit the tap insert which my husband purchased from you earlier today. The job has been successfully completed. We were impressed by the helpfulness of all involved. We couldn't recommend Highland Campervans highly enough. The service was excellent from start to finish and they made our first campervan holiday one of our best! We will be back for more! While staying at the Culloden Caravan Club site we had a problem and the wardens sent us to you. I spoke to Neil who got the technicians to help, they diagnosed the water pump need adjusting and told me how to do it and the gas regulator was kaput, I went back to the van adjusted the pump which now works great, removed the regulator to check the size, returned to get a new regulator to find that the young lady had just locked up but she opened up again to help me. So this is a thank you note for the extremely helpful and friendly service that I received from you, we need more firms like you. Thank you for brokering our vehicle for me Michael. You have been very proactive in moving things forward and in securing the sale when I would have struggled to achieve this due to my work load both here and in Europe so your help is most appreciated. Booking with Highland Campervans was so easy. We had a great time on the road! Supercalifragilisticexpialidocious! We had a thoroughly enjoyable trip. The van was a good size to access some of the smaller out of the way places. The only thing it needs is a new corkscrew. Things could have got a bit tense but I am converted! Inverness was a great starting point for us and to have Highland Campervans on the doorstep at the start of North Coast 500 route. I hope some day we will return! My experience overall was wonderful right from the get go the team were helpful and answered all my questions. The campervan was absolutely perfect and the service was personable, knowledgeable and professional. We will definitely consider you next time we visit Scotland. The trip was most definitely one of our favourite holidays. We were able to create our own adventure as we went along.It is a holiday we are already thinking of re-doing! It's the freedom of the campervan gives you to just decide where you want to go and when without any agenda. Its parking up at the bottom of a mountain then deciding to have a fry up before your walk. Its being able to park up at a beach for the night and walk on an empty beach at 10pm at night with miles and miles of sand to yourself! 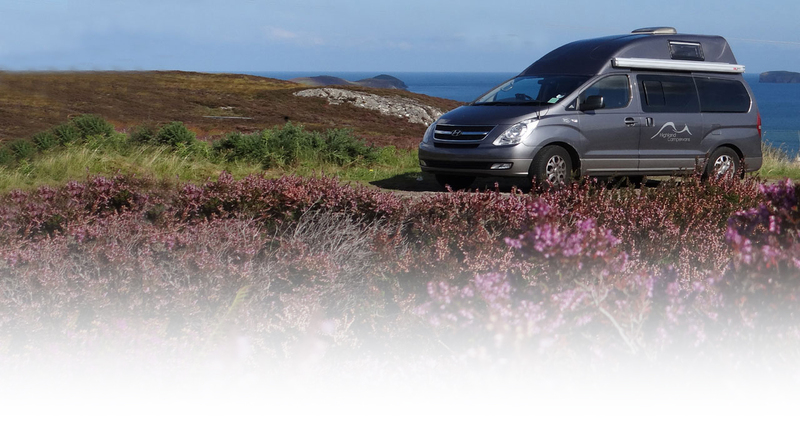 We were very happy with Highland Campervans' brokerage service and would recommend your business to anybody. "I live in the northern part of Scotland and finding a company that is committed, enthusiastic and excited about motor homes and motor homing is like searching for gold............I found gold..........the company is Highland Campervans.........I have used them for a variety of purposes, kit for the van, habitation service, fitting accessories and selling my van. All they have done has been done well, with a smile, often a cuppa and transparency about pricing. I would just like to take this opportunity to thank your staff for the great service that I received to-day. I had trouble with my TV aerial so I ordered a new one. When I arrived at your premises this afternoon the mechanic and salesman ( their names I am sorry I don't remember) took a look at the faulty one and said it could be repaired, much to my surprise. In a very short time they sorted the faulty one. 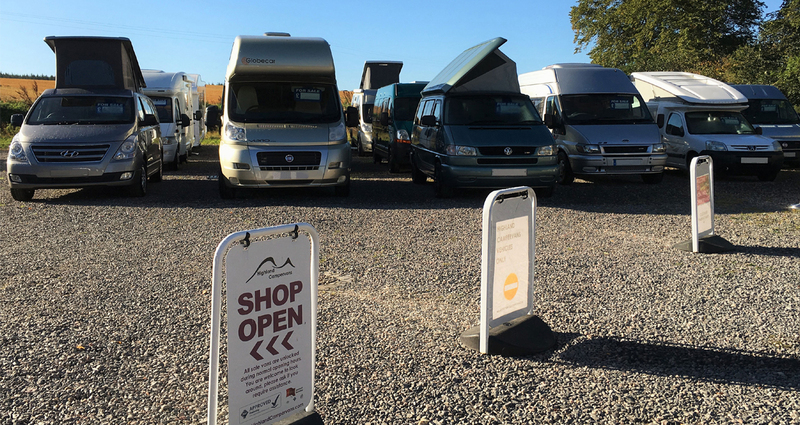 Although my vehicle was not purchased at your premises I have been a customer for some time and always find that the service given by the team at Highland Campervans is second to none. A very grateful customer. Friendly and efficient booking, pick up and drop off of the perfectly equipped and comfortable Hylander 2 left us only with the task of enjoying ourselves and the Highlands. An excellent first experience of campervanning. Thank You! I had to put on record my appreciation of the excellent service I received from your "technician" Dan on 9th July. He diagnosed competently and successfully sorted out a long standing electrical problem with my Mercedes Campervan. Just to say we appreciated all of your work last Friday when our van was serviced. Everyone was helpful, patient and willing to share knowledge and experience with us. I really do appreciate everything you have done for me the last few weeks. 10/10 for customer service. Safe to say there are two very happy customers in Caithness tonight. All the best to you all at Highland Campervans. Our first experience of a family holiday in a campervan. And we all loved it! The equipment provided was comprehensive...all in all an amazing trip! Having arrived unannounced on your door step at 3.15pm with a non functioning motor home habitat water pump, we were gone within an hour with a completely new pump and a labour bill which truly reflected the time spent on the task rather than our time in the yard. Michael and Daniel could not have been more accommodating of our dilemma and our situation. As two Aussies seemingly stranded and left 'high and dry', you guys allowed us to continue on our Scottish adventure thanks to your willingness and professionalism. Just a wee note to say how much we are enjoying having the motorhome, probably the best purchase we've made in a long time and we should have done it years ago. Can I thank you for your professional manner and support on this matter. You made a really positive impression on us and your customer service skills were exemplary.